Please do not combine this page with either Jacob or Wilhelm's individual author pages. Thank you. Saturday, March 17, 11 a.m.
Join us for a special storytime with one of our favorite children's book author Kate Coombs and featuring her two new books, Hans My Hedgehog and Water sings blue. Hans My Hedgehog is a lively and lyrical re-telling of the classic Grimm's tale reminds us of the power of music, the importance of belonging, and the transformative effect of love. Water sings blue: Ocean Poems is illustrated in gorgeous watercolors by Meilo So. Brothers Grimm is currently considered a "single author." If one or more works are by a distinct, homonymous authors, go ahead and split the author. 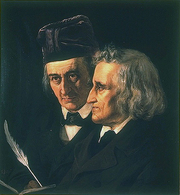 Brothers Grimm is composed of 188 names. You can examine and separate out names.